The 5th Annual Summer Jazz Workshop is coming June 18-22, 2018 at Cuesta College. 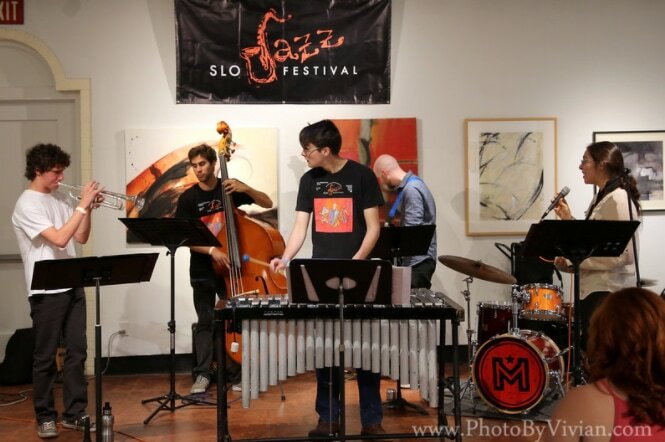 The SLO Jazz Festival's Summer Jazz Workshop is now a 5-day performance course aimed at students from Junior High through College. Each student will be instructed as to the role his/her instrument plays in a jazz ensemble. Students will also be instructed in the importance of competence on their instrument as well as how to dress and come across on the bandstand. Stage presence and team spirit will also be covered as well as how to acquire club dates and how to charge for a performance. In other words, students will be taught how to earn money as a musician if that is what the student so chooses. This summer’s workshop participants will be divided into two separate groups: “Jazz Master Class” and “Anyone Can Improvise.” The two groups will participate jointly in some exercises, but will have focused time each day for specialized lessons based on their skill level. Please use the information below to help you choose the appropriate group. Through a joint partnership between SLO Jazz Festival and Cuesta College Community Programs, with Direction from Ron McCarley, Director of Jazz Studies, we are announcing the 5th Annual Summer Jazz Workshop. Registration is open now. Registration is open soon and fee is $175 until April 20 when the fee goes up to $250. ​SCHOLARSHIPS are AVAILABLE NOW for all who qualify. Contact info @ slojazzfest . org (without spaces) for details. QUESTIONS: Contact Scott Andrews, scott @ slojazzfest (dot) org or 805-459-6939. Big Band sponsor of the Summer Jazz Workshop, an education event held June 25-29, 2018. Receive significant print, and banner behind the band benefits and ad in program. Includes 8 complimentary concert tickets. Sextet sponsor of the Summer Jazz Workshop. Receive significant print, and banner near main stage benefits and ad in program. Includes 6 complimentary concert tickets to final concert. Event sponsor of the Summer Jazz Workshop, an education event. Receive significant print benefits and ad in program. Includes 2 complimentary tickets to the final concert. All sponsors will be announced and thanked at the final concert.